An Australian-Chinese research team has made a breakthrough in hologram technology that would allow electronics the size and shape of today's current devices to display holograms. Yep, that means Hatsune Miku will literally in your pocket, ready to pop out every time you pull your phone out. The team, lead by Australia's RMIT University, has designed what it terms a "nano-hologram," which is apparently simple to make, and can be seen without 3D goggles, while being 1000 times thinner than human hair. All that's holding the technology back now is the development a rigid thin film that would be needed to go over the top of the screen to enable 3D holographic displays through it. That will be the next stage of research for the team, apparently. The potential applications for this technology are extensive. The researchers, via a media release, mentioned medical diagnostics, education, data storage, defence and cuber security. But, really, we all know that the really cool application of the technology will be in bringing the waifus into the world. “Conventional computer-generated holograms are too big for electronic devices but our ultrathin hologram overcomes those size barriers,” MIT University’s Distinguished Professor, and head of the project, Min Gu, said in the release. “Our nano-hologram is also fabricated using a simple and fast direct laser writing system, which makes our design suitable for large-scale uses and mass manufacture. “Integrating holography into everyday electronics would make screen size irrelevant – a pop-up 3D hologram can display a wealth of data that doesn’t neatly fit on a phone or watch." Seriously, people. 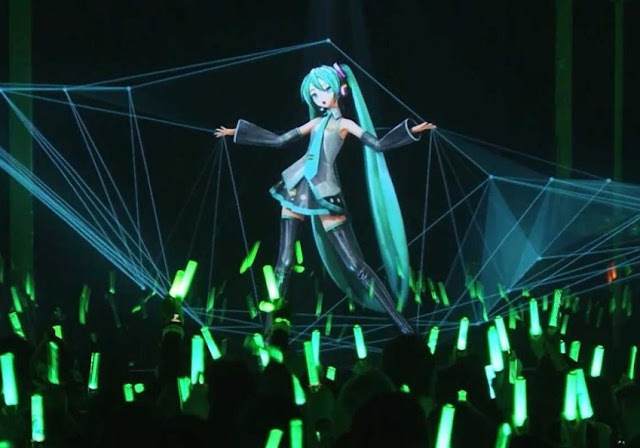 Hatsune Miku in full, glorious, physical 3D. Right there. The world is a wonderful place.